A Zelda sequel just seems weird. Sure, Majora’s Mask technically takes place directly after Ocarina of Time and the Links in the first two games are the same incarnation, but to use the same map, the same world, even the same visual style? What’s next? A new one every year? But it works. 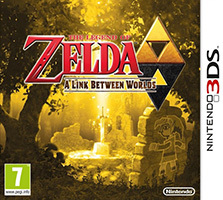 A Link to the Past is long enough ago that my memory of this map is far from perfect, and it hardly seems like we’re on a slippery slope to talking about Zelda 2015 next year – although I wouldn’t complain if there was Majora’s Mask 3D in time for next year’s list. A Link Between Worlds looks hideous in screenshots but lovely in motion, the rock solid 60fps, even in 3D, ensuring the same level of responsiveness as the SNES game. My only complaint would be that a couple of the noble experiments with the tried-and-tested Zelda structure don’t really work. The rental system, for example, takes away the fun of revisiting past areas with new items and, as far as I can tell, adds only unnecessary frustration when dying. Rupees are so abundant that it’s no great hardship to buy your items outright, and from that point the rental system has no reason to exist. The game’s also very easy, without much of a difficulty curve that is clearly a symptom of its lost structure. Still, it’s Zelda, and it’s the best in a while. Should this turn out to be the first in a Mario-esque cranking out of a familiar Nintendo series, and the quality stays this high, I won’t complain.